Does Gum Disease Affect Children? Gingivitis or periodontitis, commonly called gum disease, is a bacterial infection of the gums, soft tissues, and bones that support teeth. While more frequently associated with adults, if thorough oral habits are not in place, gum disease can affect children. Severe gum disease in children in rare, but chronic gingivitis is not. The problem begins when a child’s mouth creates a white, sticky substance called plaque. 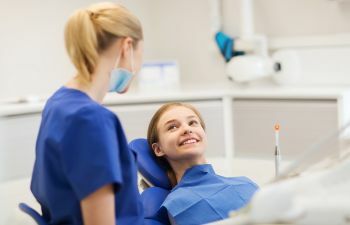 Because children are still developing their ability to brush and floss and may not be thorough, plaque accrues on the teeth and settles in around the gum line and eventually becomes tartar. The bacteria in plaque produces toxins and causes infection. Gingivitis is the first stage of gum disease and presents as inflamed, red, tender gums that bleed, receding gums, and persistent bad breath. Gingivitis that progresses becomes a more serious form of the disease known as periodontitis. Periodontitis can lead to loose teeth, bone erosion, and tooth loss. Model good oral habits for your child(ren): Demonstrate the techniques of proper brushing with your child by helping them get the brush to the fronts and backs of all the teeth and then by watching as they learn to do it on their own. It’s a good idea to brush your own teeth in front of them so that they can learn by observation too. Help them floss their teeth and let them watch as your floss your own. Check up between checkups: At your child’s bi-annual exam and cleaning, we will check for signs of gingivitis and periodontal disease. Our hygienist will remove plaque buildup and check the gums. We also recommend that parents look for signs of inflammation, bleeding, or gum recession in between visits to our office. Early detection: The best prevention for periodontal disease is early detection. The earlier the diagnosis, the better the overall outcome. If you suspect that your child may be developing gum disease, make an appointment with Dr. Park for a thorough examination for your child and to develop a treatment plan. Call us today.